Day 1 of a new job and amongst the usual swathes of induction literature, a list of 5 mandatory courses to be completed by the end of my first month. Courses which can be completed online as and when I see fit. This is fairly standard practice for large organisations. It was a national charity with offices across the country and abroad and they had been using e-learning as a central part of their induction process for a few years. Efficient? Yes, especially with such a disparate work force, but effective? Does the use of this style of e-learning, or ‘asynchronous’ learning, effectively kill the high quality learning that only comes from direct teacher-student collaboration? Or, does it provide a more effective alternative for companies looking to up skill their staff in the most efficient way possible? The advantages of this style of e-learning are fairly obvious. The learning is self-paced. We all learn better at different times, for me, taking anything of importance in before 10am is impossible, so I would structure my day so that I studied after lunch. Accessing courses is simple, on a desktop, a tablet, or even a mobile device, with a log on and internet access, or even without if the course is loaded to a hard drive. For an organisation that utilises this style of training, they can run hundreds, or even thousands of simultaneous users. Development doesn’t come cheap, but if high learner numbers are involved, a business case will invariably show it’s cheaper than the hours of teacher time, room rental, loss of working time and travel expenses accrued achieving the same outcome. The e-learning model generally includes tracking capabilities as well, especially important for mandatory or certified courses, something I found out when I received a gentle reminder with 1 week to go that I hadn’t completed one of my 5 courses. So, the disadvantages. Direct teacher-student contact or ‘synchronous’ learning is collaborative if done correctly. A good teacher will create a buzz around a subject, and different modes of teaching will be utilised to ensure learner’s different learning styles are catered for. Generally any unanswered questions are addressed during the session, and if not, contact can easily be made after a lesson. A lot of e-learning is unattributed, making question asking difficult. The courses I undertook were effective, I felt I understood the organisations key message and it helped me dust off a few skills central to my new role. But, I did find fitting the learning into my hectic schedule hard, establishing myself in the new role being my priority. I also think I would have enjoyed working with other inductees, a chance to meet people in the same situation as me and hear their thoughts and ideas on the subjects covered. So what’s the answer, to synchronise or to asynchronise? In truth, I think both. The rise of e-learning is without a doubt changing the face of learning and if done properly, I think it is only for the better. A learning management system allows standardised training to reach far and wide, increasing skill at the click of a mouse. I don’t doubt that synchronous learning allows for better quality, but there are so many variables to successful, standardised delivery that e-learning definitely has its place. The rise of this style of learning has also seen the development of technology that has moved it away from the death by PowerPoint style of learning. Developers can now utilise video and audio plug ins, quizzes, drag and drop and fully interactive role play. The 2 forms of learning do not necessarily have to be exclusive either. Webcasts and webinar functions can allow the users direct interaction with a tutor on a planned date and time. The use of asynchronous learning definitely made sense in my case. Such a large organisation would have been perpetually organising training for new employees and I would have spent the entire first month attending sessions. 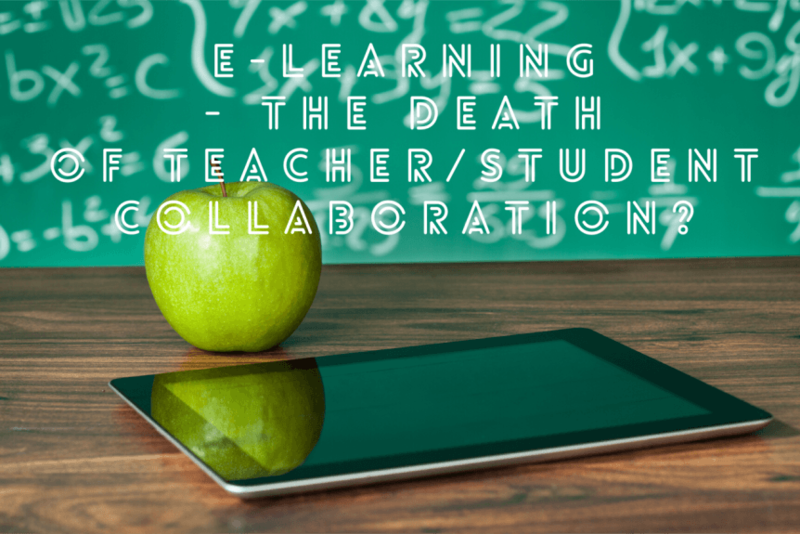 But synchronous learning has nothing to fear; teacher-student collaboration will always have its place.